Background: Smoking is a leading cause of preventable morbidity and mortality in England. This formative research involved the evaluation of SmokeFree Sports (SFS), a novel community sport intervention to prevent smoking among children and young people (CYP). Methods: SFS was implemented in five youth clubs situated in deprived communities, between February and June 2011, involving 246 CYP (6-18 years). Seventy-one CYP (median age=10.0 years, 56% male) and five youth club managers participated in this formative evaluation study, which utilised a mixed methods design. Results: Smoking prevalence at baseline and post-intervention did not differ significantly (2.8% vs. 1.4%). However, positive educational effects were observed: A lower proportion of respondents believed that smoking cigarettes was associated with weight gain or loss (80.0% to 66.2%). A higher proportion of respondents felt that once a person started smoking it would definitely be difficult to quit (52.1% to 62%). Qualitative data revealed that CYP’s awareness of smoking factors increased while youth club managers provided suggestions for future implementation. Conclusions: Sport may be a viable mechanism to educate CYP about elements of smoking and health. This study raises key characteristics for the implementation and evaluation of a definitive trial. Children are mindful of smoking from an early age.6 Many children undertake smoking for the first time in childhood4 and almost two-thirds of current and ex-smokers start smoking before the age of 18.7 Additionally, research8 shows that smoking a single cigarette in childhood is highly predictive of regular smoking in adolescence and initiation at an earlier age is a strong predictor of smoking behaviour later in life.9 Preventing smoking initiation among children is therefore an important global public health goal. Sport and recreation has been proposed as a context to embed health promotion into everyday activities.10-16 Eimeet al17 also suggest that the inherent association between sport and health means that sport may provide an ideal opportunity to integrate aspects of health promotion into a child’s environment. Youth sports coaches have the potential to be positive role models and can incorporate health promotion activity within their coaching practice16 placing them in an ideal position to be effective in supporting young people’s health through promotion, prevention and early intervention.18,19 Topics of healthy eating,20 alcohol prevention,21 mental health19,22 and injury protection18,23 have been the focus of successful health promotion efforts by sports coaches.10,24 Whilst several cross-sectional studies have reported negative associations between youth smoking and participation in sport and physical activity,25 to our knowledge there is no scientific evidence concerning whether sport and youth sports coaches can act as a possible mechanism to prevent smoking in children and young people. In light of this evidence, a campaign entitled ‘SmokeFree Sports’ was established to prevent smoking (that is, to reduce smoking onset and support those who do smoke to stop) among children and young people (CYP) in one large urban city in North West England. The campaign, which was initially piloted within five community-based youth clubs, involved educating youth sport coaches to deliver smoke free messages through an organised programme of sports activities. It is recommended that practitioners undertake formative research when developing novel health promotion initiatives to help refine the programme protocols.26 Therefore this study aimed to (i) investigate the impact of the SmokeFree Sports intervention on CYP’s smoking behaviour, intentions, attitudes and beliefs towards smoking; (ii) evaluate the level of appropriateness of the SFS campaign; (iii) identify areas of improvement to inform the development of a subsequent intervention. This study forms part of a wider programme of formative research evaluating the SmokeFree Sports campaign. Data collected from youth sport coaches will be reported elsewhere (Hilland T et al., in press). In accordance with guidance from the National Institute of Health and Clinical Excellence,29 a SmokeFree Sports logo and clear campaign messages were constructed in partnership with a leading marketing company and subsequently tested through two focus groups with CYP. The campaign was launched in February 2011. Five youth clubs were used as settings to deliver sports coaching sessions for 12 weeks. Activities were delivered in two six-week blocks (dance and dodgeball / boxing with grappling dummy and dodgeball) during school term time (typically between 4.30pm and 8pm). Five professional community coaches were recruited to deliver boxing and dance. Ten undergraduate student volunteers were trained to deliver dodgeball (UK Dodgeball Association, the Lead Coach Award). At the end of the 12 week programme a set of six dodgeballs were given to each youth club to sustain the delivery of the activity. All recruited coaches were required to attend a free educational course on giving brief interventions around smoking delivered by Roy Castle FagEnds, a local charity organisation and community-based stop smoking service. The training comprised of a 3-hour workshop that aimed at preparing coaches to deliver messages on the impact of smoking on health and sport performance.30 The coaches also received a coaching package that included a coaching manual and a set of smoke free pledges. Both elements were adapted from a successful tobacco-control programme31 from the US state of Maine called Tobacco Free Athletes. The coaches were asked to distribute the smoke free pledges among the youth club members and to ask young people to sign them. Key elements of the campaign were distributed through communication channels including flyers and posters displayed in local community settings and social media (i.e. Facebook and Twitter). Campaign collateral including skipping ropes, t-shirts, water bottles, notepads, pens and yoyos carrying the SmokeFree Sports logo were also produced. These were used to incentivise CYP’s participation and enhance retention levels by rewarding attendance to six coaching sessions. In addition, those who attended 12 sessions were rewarded with an ‘aspirational activity’ which involved a trip to an adventure centre. Five youth clubs were invited and agreed to take part in the intervention. These youth clubs were chosen because they had available sports facilities, low physical activity/sport provision, and a significant number of children in the target age range who regularly attended. In total 246 CYP participated in the SmokeFree Sports activities at least once. A convenience sampling strategy was used to recruit CYP from participating youth clubs into the research study. Informed parental consent and child assent was obtained from 83 CYP, of which 71 participants completed both baseline and follow up questionnaires. Thirty-four-CYP (10 female and 24 male) volunteered to take part in mixed gender focus groups (n=9), which took place in youth clubs immediately following the intervention. Each youth club manager (n=5) consented to take part in an interview between August and September 2011. To be able to appropriately inform future implementations, a formative evaluation was employed due to the early stage of development of the SFS campaign.26 Formative research assists to test concepts, programme materials and methods, and understand whether the intervention is accepted and appropriate in the target population.32 In formative research, mixed methods designs are frequently utilised to define essential programme elements and observe interventions from different perspectives.32 Therefore, a quantitative approach was considered to explore the impact of the intervention on CYP. In addition, a qualitative approach was applied to 1) further explore the impact of the intervention on CYP, 2) to gain insight into the appropriateness of the pilot intervention, and 3) to inform development of future implementation. To assess the impact of the intervention on smoking, a questionnaire was constructed using items from the validated Health Survey for England33 and Global Youth Tobacco Survey,34 which was distributed pre- and post-intervention. Questions included demographic information (i.e. gender, age, postcode and ethnicity), smoking behaviour, smoking intentions, and knowledge and attitudes about smoking. Focus groups explored CYP’s responses to the smoking questionnaire, appropriateness and improvements of future implementation in greater depth. Key areas of discussion included perspectives on the activities delivered as part of the intervention, recall of campaign messages, coaching practices, and views for improvement of the intervention. A schedule ensured that the required topics were covered whilst also allowing participants to respond freely. The focus groups (n=9) lasted from 15 to 45 minutes, were conducted in groups of three to seven CYP and were audio recorded using a Dictaphone. Semi-structured interviews explored youth club managers’ (n=5) views and opinions of the level of appropriateness and impact of the SmokeFree Sports intervention. Key areas for discussion included social marketing; impact of the campaign on CYP’s smoking behaviour, attitudes and knowledge; and suggestions for improvements to the campaign. Interviewees were given the opportunity to make comments about issues that were not specifically covered. Interviews were audio recorded and lasted between 20 and 50 minutes. Prior to data analysis, questionnaires were collated and checked for anomalies using descriptive statistics. After checking for data normality, the Wilcoxon signed-rank test was applied to test for differences in questionnaire scores between the baseline and follow-up. Statistical significance was set at p< 0.05 and all analyses were conducted using SPSS version 17.0. Focus groups and interviews were transcribed verbatim, imported into NVivo 2.0 software and subsequently analysed following a recommended six-phase approach to thematic analysis.35,36 Phase one (familiarisation with the data) involved reading and re-reading of the data and noting down initial ideas. Phase two (generating initial codes) involved coding interesting features of the data in a systematic fashion whilst collating data relevant to each code. Phases three through five involved the further searching, reviewing, defining and naming of themes. During phase six (producing the report) a thematic map of the analysis was generated of which master themes are presented as subheadings within the results section. This process was led by the first author and critically questioned at each step by three researchers (LF, TH and RM). When disagreements occurred, alternative interpretations of the data were provided until an acceptable consensus was reached by the involved researchers. Child assent and adult consent to participate in this study were gained. Ethical approval was granted by Liverpool John Moores University Ethics Committee (reference: 11/SPS/007). Participants were aged between seven and 18 years, median = 10.0 (interquartile range = 9.0 to 13.0), 56.3% were male, 88.7% were white British, 1.4% were black British, 4.2% were mixed black and white and 2.8% were of other mixed ethnicity. Results are presented based on the whole sample (n=71). Table 1 displays quantitative findings surrounding the impact of the intervention on intentions, knowledge and attitudes about smoking. At baseline, 97.2% of participants reported that they did not currently smoke; 2.8% of participants were current smokers (n=2 males). Eighty percent of participants had never smoked, 16.9% had tried smoking once, and the remaining 4.2% of participants described themselves as either having used to smoke (1.4%), sometimes smoke (1.4%) or smoked over 6 cigarettes per week (1.4%). Likewise, the majority of the CYP who participated in the focus groups said that they did not smoke, although a few mentioned that they had tried it. Youth club managers were aware that only a small number of smokers attended the youth clubs, “we have very few smokers here in our young people”. There were no significant differences between smoking prevalence at baseline and follow-up (2.8% vs. 1.4%). Youth club managers confirmed that the intervention did not have an impact on the CYP’s behaviour, with one youth club manager saying: “in relation to stopping or reducing their smoking, nothing has changed because they weren’t heavy smokers to start with”. At baseline, nine out of ten CYP ‘definitely agreed’ that smoking is bad for their health (Table 1). However, there was a range of responses given by participants surrounding items on smoking and weight gain and whether or not it is difficult to quit smoking once you have started. More specifically, 80.0% of participants thought that smoking cigarettes was associated with weight gain or loss, 40% said, if they were to quit, they would use effective slimming pills here to balance the weight gain out and 22.5% stated that smoking cessation was ‘probably not’ or ‘definitely not’ difficult. Post-intervention, there was a significant increase in the proportion of respondents who felt that once a person started smoking it was difficult to give up (z=-2.71, p < .05). Furthermore, there was a significant 13.8% increase in the proportion of respondents who believed that smoking cigarettes was not associated with weight gain or weight loss at follow-up (z=-2.132, p < .05). No significant differences were found in the proportion of respondents who felt that it was definitely not safe to smoke for one to two years. Whilst there was no significant intervention effect on CYP awareness that cigarettes were bad for their health (likely due to a ceiling effect), qualitative data revealed further insights. For example, CYP remembered learning about the components of a cigarette, “Yes and you know like the brown stuff, it’s called…tobacco. That’s like the worst stuff”, and “when those people came in they showed you how much toxic stuff they had in it, tar is it?” Others commented that they had gained new knowledge about the types of illnesses and health consequences of smoking, for example saying: “About the damage to your lung cancer, didn’t know about that”.CYP declared that they were already against smoking before the start of the SmokeFree Sports campaign, “I have always felt this way, but I have learned a little bit more since being involved in dodgeball”. However, whilst they recognised that they did not change their views on smoking, some felt more aware about the negative consequences, “I knew it was dangerous, but I never knew it was that dangerous”.This aspect was also perceived by one youth club manager, who remarked that the intervention reinforced CYP’s non-smoking attitudes,“I think it’s re-affirmed for them you know that this is not a good thing to do… definitely”. CYP and youth club managers were aware of the purpose of the SmokeFree Sports campaign, “to persuade people not to smoke”. However, children and young people only remembered part of the SmokeFree Sports campaign’s name, suggesting answers such as “SmokeFree thing”, “SmokeFree”, “Smoking”, “Erm, smoke free dodgeball… something like that”. In addition, none of the children and young people in the focus groups could recall all three intervention sports that were delivered in the youth clubs. CYP from five focus groups verbalised that they had received smoke free messages during coaching sessions, for example one child said “the coach who did the boxing said that each cigarette takes 3-4 minutes off your life”. Messages were usually delivered immediately before or after the coaching sessions. However, a substantial number of participants noted that they had never heard any smoking messages. A few participants made positive statements about the coaches and recalled some of the smoking-related activities and resources that coaches used. Some participants appeared to be willing to listen to coaches’ talk about smoking issues although a minority of participants mentioned the incongruence of being told not to smoke by people who are smokers. Most of the participants were aware of the existence of SmokeFree Sports collateral and the incentives scheme, “it’s like every 5 times you come, you get like a prize and you get like a top, a bag and a water bottle. I think its 12 times you get a whistle”. Some participants were asked whether the incentives were the main motivation forattending the coaching sessions but most denied this saying things such as, “no, because I don’t really care about the gifts”. The most common reason to attend the activities was for enjoyment, “it was fun and I just like playing the games”. However, CYP also gave other reasons including: (1) to alleviate boredom, “there’s nothing else to do”; (2) an inclination towards the sports offered, “…we like dodgeball so we just started coming”; (3) coach-related, “because the coaches were good”; (4) a learning component, “we learned about smoke free and about what not to do and what to do”; or (5) a social component,“we got more friends”. All youth club managers stated that they would support future SmokeFree Sports Campaigns. Four out of five youth club managers expressed positive views regarding the philosophy of the SmokeFree Sports campaign, saying it was “a great campaign,” and “absolutely fantastic, the whole idea of SmokeFree Sports”. The remaining youth club manager reported several negative points about the campaign including: getting only one activity that was already part of the existing activities offered by the youth club (dodgeball); SmokeFree Sport coaches not being able to engage with participants; organisation-related problems of the aspirational activity. To our knowledge, SmokeFree Sports is the first intervention in the UK to use sport to prevent smoking among CYP. We examined the impact of a preliminary SmokeFree Sports intervention on CYP’s smoking prevalence, intentions, attitudes and knowledge towards smoking behaviour, evaluated level of appropriateness of the SFS Campaign, and identified areas of improvement. Research findings regarding the impact of the SFS campaign revealed that a high proportion of CYP were non-smokers at pre-intervention. Positive educational effects were observed in relation to understanding the interaction between smoking and health. Awareness of smoking factors increased and participants stated that the campaign made them more determined to stay smoke free. Furthermore, the campaign was well received by CYP and youth clubs managers. These initial findings await confirmation in a definitive study with follow-up, but appear to lend support to the use of sport as a vehicle to deliver smoke free messages. The intervention had no effect on CYP’s smoking behaviour though the sample was characterised by a high proportion of non-smokers pre-intervention. It is possible that there could be some participation bias with non-attenders to the youth clubs or sports activities differing in their smoking behaviour from attenders. Prevalence of regular smoking significantly increases during the teenage years;4 however, in this sample two-thirds of participants were aged between seven and 12 years. Therefore, the high proportion of non-smokers likely reflected the age range of the sample. Youth club managers confirmed that most children at the youth club were not smokers. This suggests that future interventions that target similar aged participants should consider concentrating efforts towards reducing smoking onset. Further research with a higher proportion of smokers is needed to determine the appropriateness and impact of the intervention as an aid to smoking cessation in CYP. Smoking experimentation represents a high risk for becoming a regular smoker in the future;8,9 one in five participants had tried smoking at least once in the past. It was therefore encouraging that CYP who did not smoke at baseline remained smoke free at follow-up. Further, a highproportion of participants did not intend to smoke even if their friend offered them a cigarette – a positive finding given that most participants highlighted having peers who smoked and a recent study found that adolescents’ smoking was strongly associated with best friends’ smoking.37 A child regarded that ‘smoking was their [peers] own choice’. This resilience to undertaking smoking behaviours despite potential peer influence suggests that the knowledge gained from SmokeFree Sports could help tackle such social norms found in other research.38 Peer smoking together with boredom and curiosity has been identified as the principal reasons of starting smoking within young people.38 The majority of children verbalised that at least one member of their immediate or extended family smoke. This is important as parental smoking is also a predictor of smoking uptake in later life.39,40 These social influences may warrant the addition of a family and peer component to the intervention and further support a prevention focus within future campaigns. This study demonstrated CYP’s knowledge about the harmful effects of smoking increased following the intervention. CYP from five focus groups mentioned knowledge gains through SmokeFree Sports (i.e. of harmful effect, impact on weight status and recognition of addictive component). One child stated that this made them more determined to ‘never’ start smoking. Knowledge concerning smoking has previously been measured within community smoking prevention interventions for young people and some interventions have successfully demonstrated an impact.41 Specifically, we found positive educational effects for topics including the influence of smoking on weight status and recognition of its addictive component. However, it is difficult to directly compare knowledge gains found within this study with other interventions because of methodological differences. Some studies42 have explored varied knowledge items such as refusal skills or decision-making, others43 focused only on a single item such as ‘harm caused by tobacco’, while others44 did not specify any particular item. It has been shown that child smoking is driven by social relations, such as gaining group membership, and that children who smoke do not recognise that they have nicotine dependence as adults tend to do.45 This makes CYP vulnerable towards nicotine addiction and could explain why some participants did not recognise the addictive risk of smoking at baseline. 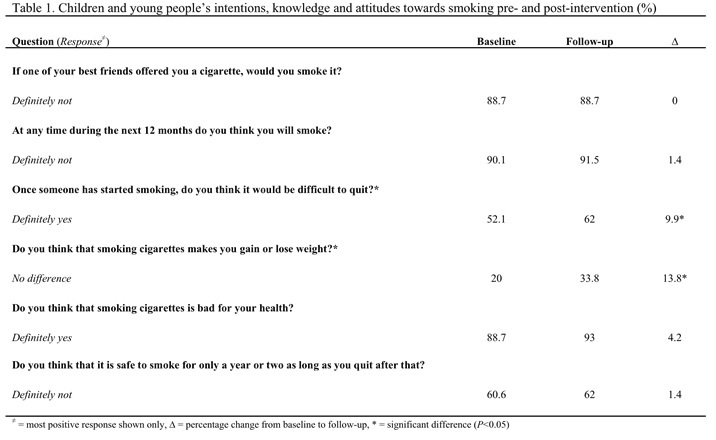 In terms of the identified improvements in CYP’s understanding of the consequences of smoking for body weight; Potter’s review46 shows that several studies have found a positive relationship between body weight concerns and smoking amongst adolescents, which can be a trigger for smoking initiation. The relationship was stronger within female adolescents when dieting behaviours were also considered.46 Adolescent girls often perceive that smoking can help them to lose body weight by suppressing hunger. These beliefs matched with societal pressures for females to be thin may act as a trigger for smoking initiation alongside dieting.47 Encouragingly, SmokeFree Sports helped CYP to recognise that smoking per se does not affect body weight – rather it is the effects of nicotine in the brain that may act as an appetite suppressant.48 It is perhaps understandable that CYP are confused about the consequences of smoking for weight: light smokers tend to have lower body weight than do non-smokers, whilst in contrast heavy smokers tend to have greater body weight than non-smokers.49 A key message included in the SmokeFree Sports coaching manual was that regular physical activity, not smoking, was important for maintenance of a healthy weight. Our findings indicate that this message may have been effective in changing CYP’s beliefs about the consequences of smoking for weight. Whilst we cannot attribute causality directly to the intervention due to the lack of a control-comparison group, the mechanism for the intervention effects warrants further study. Sport has been suggested as a setting for health promotion.10-16 It could be postulated, from a socio-ecological perspective, that the coaches’ social influence may have played a role in influencing the CYP’s attitudes and beliefs about smoking, since coaches can be seen by athletes as adult role models to look up to.50 We could also speculate, in accordance with PRIME theory,51 that participation in sport and physical activity may help CYP to establish a strong non-smoker identity. Additional experimental research including a comprehensive process evaluation of the intervention is needed to determine the salient influencing factors. In terms of the level of appropriateness and future improvements, CYP were aware of the social-marketing campaign, possibly through receiving SFS branded collateral and incentives. However, most of them verbalised that these incentives did not motivate them to participate in the activities. In fact, enjoyment and the activities themselves were the primary motivational factors. Therefore, it is recommended that future campaigns with social marketing components find a cost-effective compromise between incentivising participation and raising brand awareness. In relation to a campaign legacy, youthclub managers felt that the smoking cessation training course provided an opportunity to build partnerships with local smoke free organisations and build capacity for conducting further smoke free initiatives in house. Overall, youth club managers considered SmokeFree Sports a novel programme and supported the philosophy of promoting positive smoke free messages through sports. Regarding future interventions, lessons were learned from the implementation and delivery of the SmokeFree Sports campaign activities and messages. CYP recalled that coaches typically delivered smoke free messages before or after the activity sessions but scarcely during sessions. Consequently, coaches may need practical tips and creative ideas to incorporate smoke free messages within sports activities. Further, youth club managers suggested that the activities should last longer than 12 weeks to enable coaches to build a solid connection with CYP in order to make a stronger impact on their attitudes, knowledge and intentions. Building rapport has been highlighted as one of the essential aspects to take into consideration by practitioners in charge of screening and counselling young people who smoke cigarettes.52 Therefore, it is recommended that if sport coaches are not familiar with the participants, team building activities should be included at the start of the coaching programme to foster relationships. This is especially important if the campaign is delivered within challenging environments such as community-based settings (i.e. youth clubs). There are a number of limitations to this study. Firstly, this study did not include a control/comparison group. However, it has been acknowledged that community-based interventions are difficult to evaluate particularly in relation to the difficulties of establishing control groups.53 Secondly, this was a pilot study conducted in two areas of Liverpool; the number of intervention settings was restricted and the sample size was low, limiting the generalisability of the findings. Recruitment of the target population to the research study at youth club settings was particularly challenging. Thirdly, a self-report questionnaire was used as a method to measure smoking and it is possible that respondents may have underreported their smoking habits.54 On the other hand several strengths of the study were identified. Participants were reached through natural settings that were not artificially created to accommodate research purposes, therefore enhancing the ecological validity of the findings.55 In addition, a mixed methods approach was employed to address the research questions, producing more complete knowledge to inform theory and practice and providing stronger evidence through the convergence and corroboration of findings.32,56 Further, this preliminary intervention was designed through strong collaborative action with local partners and stakeholders building on formative work with children. In conclusion, a novel SmokeFree Sports campaign appears to be a promising vehicle to educate CYP about smoking and health. The use of sports coaches to deliver smoke free messages could provide a sustainable model for tobacco control programmes to dispel myths around smoking and health. Recommendations for future research and implementation are, firstly, for a randomised controlled trial to be conducted with the inclusion of robust measures of smoking status; if the aim is prevention, mediating factors (e.g. decision making and refusal skills)40 or determinants of behaviour that are sensitive to change and specific to the intervention’s purpose. Moreover, intermediate and outcome measures should be accompanied by a process evaluation to determine implementation of campaign messages, and effectiveness of various coaching styles and practices. Secondly, apply a health promotion framework and behaviour change theory, such as the socio-ecological model15,57 and theories of Planned Behaviour58 or Social Learning,59 to guide the design and evaluation of the intervention. Thirdly, assess smoking behaviour objectively, for instance using a breath carbon monoxide monitor, instead of relying on self-reported information. Fourthly, include recruitment and retention strategies to ensure a definitive study is sufficiently powered.60 Fifthly, a follow-up study is needed to determine whether belief changes had an impact on smoking behaviour in later life. Finally, views on the SFS campaign from CYP and youth club managers on the provided incentives, duration of the activities, pledges and the delivery of smoke free messages will inform the future implementation. This project was commissioned by Liverpool Primary Care Trust using funding from the Local Government Improvement and Development Agency. 1. World Health Organization. WHO report on the global Tobacco epidemic: warning about the dangers of tobacco. Geneva: WHO; 2011. 2. Department of Health. Healthy lives, healthy people: A tobacco control plan for England. London; 2011. 3. Nash R, Featherstone H. Cough up: balancing tobacco income and costs in society. London: Policy Exchange; 2010. 4. NHS Information Centre. Smoking, drinking and drug use among young people in England in 2010. London: National Centre for Social Research; 2011. 5. NHS Information Centre. Statistics on Smoking: England, 2011. London; 2011. 6. Office for National Statistics. Teenage smoking attitudes survey, 1996. London: Stationery Office; 1997. 7. Office for National Statistics. General Lifestyle Survey, Smoking and Drinking among adults, 2009. London: Stationary Office; 2011. 8. GervaisA, O’Loughlin J, Meshefedjian G, Bancej C, Tremblay M. Milestones in the natural course of onset of cigarette use among adolescents. Canadian Medical Association Journal, 2006; 175: 255–261. 9. KhuderSA, Dayal HH, Mutgi AB. Age at smoking onset and its effect on smoking cessation. Addictive Behaviors, 1999; 24: 673-677. 10. Donaldson A, Finch CF. Editorial: Sport as a setting for promoting health. British Journal of Sports Medicine, 2012; 46: 4-5. 11. KokkoS, Oja P, Foster C, Koski P, Laalo-Häikiö E, Savola J. Sports club for health – guidelines for health-oriented sports activities in a club setting. Finnish Sport for All Association, 2011. 12. Almond L, Almond M, Saunders L. Coaching sport for health: a review of the literature. Sports Coach UK, 2013. 13. KokkoS, Kannas L, Villberg J. The health promoting sports club in Finland – a challenge for the settings-based approach. Health Promotion International, 2006; 21: 219-229. 14. Kokko S, Kannas L, Villberg J. Health promotion profile of youth sports clubs in Finland: club officials’ and coaches’ perspectives. Health Promotion International, 2009; 24: 26-35. 15. Kokko S, Green LW, Kannas, L. A review of settings-based health promotion with applications to sports clubs. Health Promotion International, Published Online First: 30 June 2013. doi:10.1093/heapro/dat046. 16. SkilleEA. Competitiveness and health: the work of sports clubs as seen by sport club representatives – a Norwegian case study. International Review for the Sociology of Sport, 2010; 45: 73-85. 17. EimeRM, Payne WR, Harvey JT. Making sports clubs healthy and welcoming environments: A strategy to increase participation. Journal of Science and Medicine in Sport, 2008; 11: 146-154. 18. GlangA, Koester MC, Beaver S, Clay J, McLaughlin K. Online training in sports concussion for youth sports coaches. International Journal of Sports Science and Coaching, 2010; 5: 1-11. 19. MazzerKR, Rickwood DJ, Vanags T. Teachers and sports coaches supporting young people’s mental health: promotion, prevention, and early intervention. World Academy of Science, Engineering and Technology, 2012; 66: 489-494. 20. Kelly B, Baur LA, Bauman AE, King L. Examining opportunities for promotion of healthy eating at children’s sports clubs. Australian and New Zealand Journal of Public Health, 2010; 34: 583-588. 21. King KA, Dowdall MP, Wagner DI. Coaches’ attitudes and involvement in alcohol prevention among high school athletes. Journal of Community Health, 2010; 35: 68-75. 22. BapatS, Jorm A, Lawrence K. Evaluation of a mental health literacy training program for junior sporting clubs. Australasian Psychiatry, 2009; 17: 475-479. 23. Saunders N, Otago L, Romiti M, Donaldson A, White P, Finch, CP. Coaches’ perspectives on implementing an evidence-informed injury prevention programme in junior community netball. British Journal of Sports Medicine, 2010; 44: 1128-1132. 24. Fuller CW, Junge A, DeCelles J, Donald J, Jankelowitz R. Football for Health – a football-based health promotion programme for children in South Africa: a parallel cohort study. British Journal of Sports Medicine, 2010; 44: 546-554. 25. KatcynskiAT, Manske SR, Mannell RC Grewal K. Smoking and physical activity: A systematic review. American Journal of Health Behavior, 2008; 32: 93-110. 26. Milton K, Kelly P, Bull F, Foster C. A formative evaluation of a family-based walking intervention – Furness Families Walk4Life. BMC Public Health, 2011; 11: 614. 27. Department for Communities and Local Government. The English Indices of Deprivation, 2010. 28. Liverpool Public Health Intelligence Team. Key demographic and health statistics. Liverpool: Liverpool Primary Care Trust. London: Department for Communities and Local Government; 2010. 29. National Institute for Clinical Excellence. Preventing the uptake of smoking by children and young people, 2008. 30. FoweatherL, Hilland T, Romeo-Velilla M, McGee C, Parnell D. SmokeFree Sports project report, 2011. 32. NutbeamD, Bauman A. Evaluation in a nutshell: a practical guide to the evaluation of health promotion programs. N.S.W., Australia: McGraw-Hill; 2006. 33. National Health Service Information Centre. Health Survey for England 2007: Healthy lifestyles, knowledge, attitudes and behaviour, 2008. 35. BoyatzisR. Transforming qualitative information: Thematic analysis and code development. CA: Sage; 1998. 36. Braun V, Clarke C. Using thematic analysis in psychology. Qualitative research in psychology, 2006; 3:77-101. 37. TjoraT, Hetland J, Aarø3 LE, Øverland S. Distal and proximal family predictors of adolescents’ smoking initiation and development: A longitudinal latent curve model analysis. BMC Public Health, 2011; 11: 911. 38. Bricker JB, Peterson JAV, Andersen MR, Leroux BG, Rajan KB, Sarason IG. Close friends’, parents’, and older siblings’ smoking: Reevaluating their influence on children’s smoking. Nicotine and Tobacco Research, 2005; 8: 217-26. 39. Den ExterBlokland EA, Engels RC, Hale WW, Meeus W, Willemsen MC. Lifetime parental smoking history and cessation and early adolescent smoking behaviour. Preventive Medicine, 2004; 38: 359–368. 40. Otten R, Engels R, van de Ven M, Bricker JB. Parental smoking and adolescent smoking stages: The role of parents’ current and former smoking, and family structure. Journal of Behavioral Medicine, 2007; 30: 143-154. 41. Carson KV, Brinn MP, Labiszewski NA, Esterman AJ, Chang AB, Smith BJ. Community interventions for preventing smoking in young people. Cochrane Database of Systematic Reviews, 2011; 7, CD001291. 42. BotvinGJ, Griffin KW, Paul E, Macaulay AP. Preventing tobacco and alcohol use among elementary school students through life skills training. Journal of Child & Adolescent Substance Abuse, 2003; 12: 1-17. 43. Lee P, Wu D, Lai H, Chu N. The impacts of a school-wide no smoking strategy and classroom-based smoking prevention curriculum on the smoking behavior of junior high school students. Addictive Behaviours, 2007; 32: 2099-2107. 44. Mahabee-Gittens M, Vaughn L, Gordon J. Youths’ and parents’ views on the acceptability and design of a video-based tobacco prevention intervention. Journal of Child & Adolescent Substance Abuse, 2010; 19: 391–405. 45. RugkåsaJ, Knox B, Sittlington J, Kennedy O, Treacy MP, Abaunza PS. Anxious adults vs. cool children: children’s views on smoking and addiction. Science & Medicine, 2001; 53: 593. 46. Potter BK, Pederson LL, Chan SSH, Aubut JL, Koval JJ. Does a relationship exist between body weight, concerns about weight, and smoking among adolescents? An integration of the literature with an emphasis on gender. Nicotine & Tobacco Research, 2004; 6: 397–425. 47. Maldonado-Molina MM, Komro KA, Prado G. Prospective association between dieting and smoking initiation among adolescents. American Journal of Public Health, 2007; 22: 25-32. 48. Seeley RJ, Sandoval DA. Neuroscience: Weight loss through smoking. Nature, 2011; 475: 176-177. 49. ChioleroA, Faeh D, Paccaud F, Cornuz J. Consequences of smoking for body weight, body fat distribution, and insulin resistance. American Journal of Clinical Nutrition, 2008; 87: 801-9. 50. Fraser-Thomas J, Côté J. Understanding adolescents’ positive and negative developmental experience in sport. Sport Psychologist, 2009; 23: 3-23. 51. West R. Theory of addiction. Oxford: Blackwells; 2006. 52. Stevens S, Pailler M, Diamond G, Levy S, Latif S, Kisman S. Providers’ experiences caring for adolescents who smoke cigarettes. Health Psychology, 2009; 28: 66-72. 53. CART. Developing methodologies for evaluating community-wide health promotion. Health Promotion International, 1996; 11: 227-336. 54. Lewis SJ, Cherry NM, Niven RM, Barber PV, Wilde KP. Cotinine levels and self-reported smoking status in patients attending a bronchoscopy clinic. Bio-markers, 2003; 8: 218-228. 55. Watson PM, Dugdill L, Murphy R, Knowles Z, Cable NT. Moving forward in childhood obesity treatment: A call for translational research. Health Education Journal, 2013; 72: 230-239. 56. Johnson RB, Onwuegbuzie AJ. Mixed methods research: a research paradigm whose time has come. Educational Researcher, 2004; 33: 14-26. 57. SallisJF, Owen N, Fisher EB. Ecological models of health behaviour. In: Glanz K, Rimer BK, Viswanath, K, eds. Health behaviour and health education: Theory, research and practice. San Francisco, C.A. : Jossey-Bass; 2008. 58. AzjenI. The theory of planned behaviour. Organizational Behavior and Human Decision Processes, 1991; 50: 179-211. 59. Bandura A. Social learning theory. Englewood Cliffs, N.J: Prentice Hall; 1977. 60. SchoeppeS, Oliver M, Badland HM, Burke M, Duncan MJ. Recruitment and retention of children in behavioural health risk factor studies: REACH strategies. International Journal of Behavioral Medicine, Published Online First: 3 October 2013. Doi: 10.1007/s12529-013-9347-5 .